Cleaning, organizing, and simplifying will more than likely leave you with piles of unwanted stuff. But what do you do with the stuff? The obvious choice would be to put it in a designated spot in the garage in anticipation of your next Garage Sale! When the time comes, how do you set garage sale prices? Garage sale prices are expected to be rock bottom. 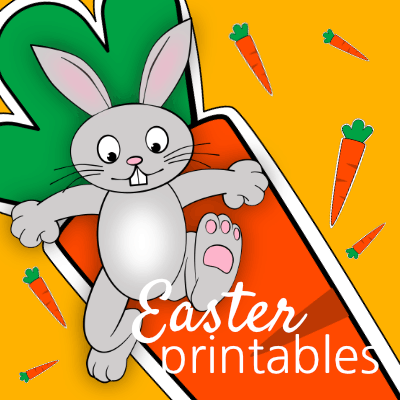 It’s the last ditch effort to make a little money before you give it away. That doesn’t mean you should be taken advantage of. It simply means you need to be realistic when you set your garage sale prices. The popular range for garage sale prices is anywhere from 10% – 33% of the original cost, depending on the condition of the item. Does that mean if I paid $200 for a pair of jeans I could set the price at $66? Probably not, even if they are in excellent shape. The low end of 10% might even be a little much for customers who are used to paying no more than $5 a pair and could care less about brands. Realistically, it’s best to think how much YOU would be willing to pay for an item at a garage sale. If that price just isn’t enough, you may want to consider selling your item on eBay or another online site. This is where people may be looking for exactly what you have and know the true value. Case in point, I had a pair of boots that were just a tad too big but I had worn a few times. They sat in my closet for a few years before I finally listed them on eBay for $100 (original price was $250). They sold right away to a lady who had been searching for that exact boot! I would have been lucky to get $10 for that pair of boots at a garage sale. On the flip side, you may have merchandise that is surely destined for the dump. Don’t underestimate your dump worthy items. They just might be worth something to someone! The pitcher cracked on our Sunbeam blender. No, I didn’t try to sell the cracked pitcher! I did, however, sell the base at our annual garage sale. Sure, I only charged a buck for it but, guess what, I saved it from the landfill and I’m a dollar richer! We paid $50 for a pair of red high top Converse that my son wore into the ground. Seriously, those Converse were quite worn out and probably garbage worthy. There was no way I would even put a 10% amount on those things. My thought process was, someone would love to have them for a scarecrow or perhaps to plant something in. That might be worth $1, right? Let me tell you, those things were the first to go! Maybe we could have gotten the $5. I was just happy to save them from the landfill a little bit longer! On the other hand, if you really think it belongs in the garbage, it doesn’t hurt to make a free pile. After the sale, you can head to the dump, hopefully with less stuff! It is often suggested to set garage sale prices 25% – 50% above the price you actually want in order to leave room for negotiations. Many garage sale customers don’t like to negotiate and may leave empty handed if prices are high. Because I don’t want to scare customers off with high prices, I like to set garage sale prices at the price I actually want for the item. If it doesn’t sell, I’m willing to negotiate towards the end of the sale. At one recent garage sale, my husband brought over an old fire pit in the middle of the afternoon. We put a $10 price tag on it and within five minutes a customer asked to purchase it for $5. It was super easy to say, ‘we just brought it out and I’d like to wait and see if we can get the $10 for it, we will be ready to negotiate tomorrow afternoon though’. Guess what? That lady bought it, on the spot, for $10. She knew it was a deal, she just had to try her luck. If you aren’t sure of the value of a particular item, rather than sell it too cheap, check out eBay and see what the item has sold for (not listed). Price your item at 50% – 75% of the price eBay is selling it for. We’ve all heard stories of people buying artwork worth thousands of dollars for mere pennies at garage sales. Know what your merchandise is worth! Of course, if it’s worth thousands, it probably doesn’t belong at a garage sale. The serious customers are the ones who probably show up first looking for the best bargain. They may even be reselling their finds on eBay. That’s okay! They are saving you the time and effort to list your items on eBay. The goal is to set garage sale prices in a way that gives resellers a chance to make money themselves. If you want eBay prices, sell it on eBay! If your merchandise is like new and in original packaging, you will be able to ask more for it than the merchandise without original packaging. A sheet set that was used for a short time laundered, folded nicely, and placed in the original packaging sold for $5 without question. 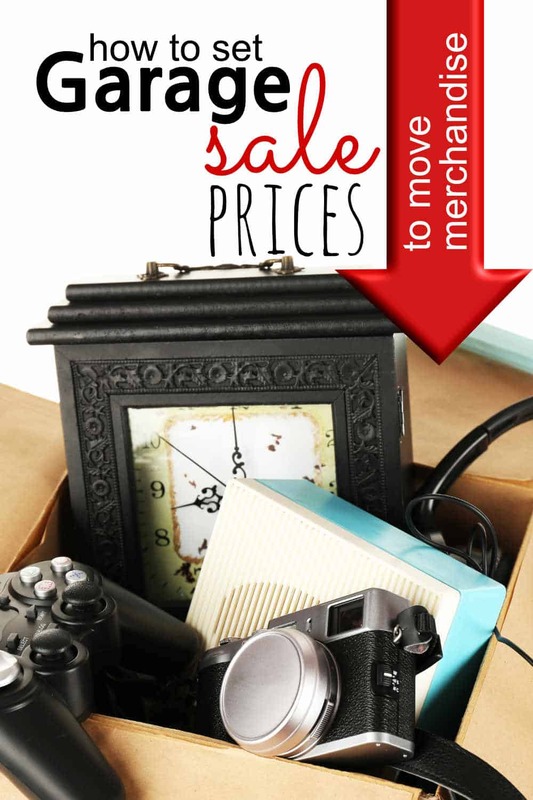 Damaged merchandise is priced at a steal simply to save it from the landfill. For more specifics on how to price individual items, check out The Garage Sale Tracker. Garage sales are an excellent way to clean house and earn a few dollars! You just have to determine if your merchandise is garage sale worthy, if you’re willing to negotiate, know the worth of your merchandise, be willing to let your customers make a profit, and check out the condition. Of course, you can always change the price during the sale too. It’s your sale and you can do what you want to! Now that your garage is cleared out, are you ready to organize and start a new pile? That’s what that designated spot in the garage is for, after all! 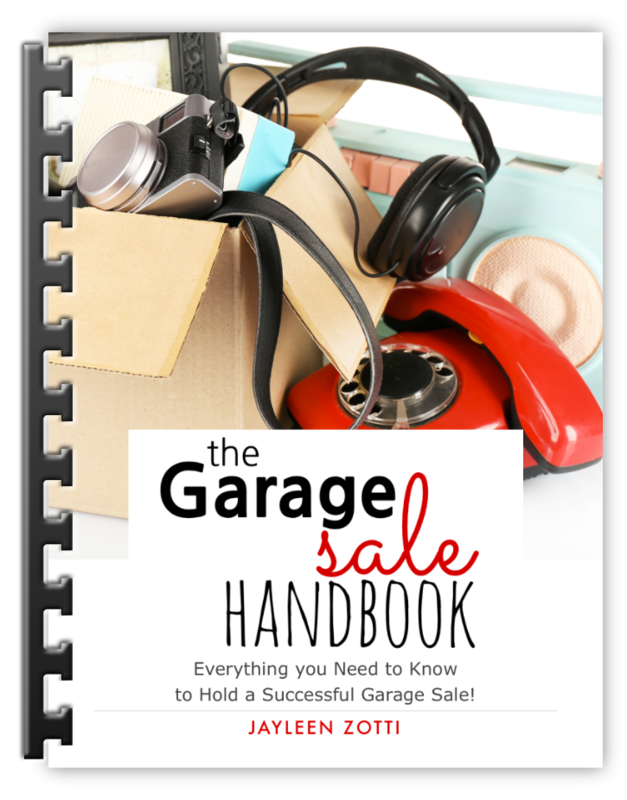 Everything you need to know to hold a successful garage sale in 29 easy to read pages + 16 printables to keep you on track! You Did It! Now check your email to confirm your subscription. Password: HAPPY Your email confirmation also contains this information! Oh my goodness, Kay! Too funny! I’m sure your feet aren’t THAT big! So good to hear from you!! !